A Richmond construction worker who has been detained for nearly two years while fighting deportation will get a bond hearing and a new chance for freedom, a San Francisco federal judge ruled on Tuesday. Magistrate Judge Sallie Kim ordered that Raul Lopez, an undocumented immigrant from Guatemala, be given a bond hearing within 15 days. Lopez, 46, was detained by Immigration and Customs Enforcement in March 2017. He was first held at Contra Costa County’s West County Detention Facility in Richmond and later transferred to a private prison in Colorado, more than 1,200 miles from his attorneys and family. As of last June, Lopez was one of about 2,000 people who had spent more than a year in immigration jail, according to the Transactional Records Access Clearinghouse, a nonpartisan immigration research project at Syracuse University. 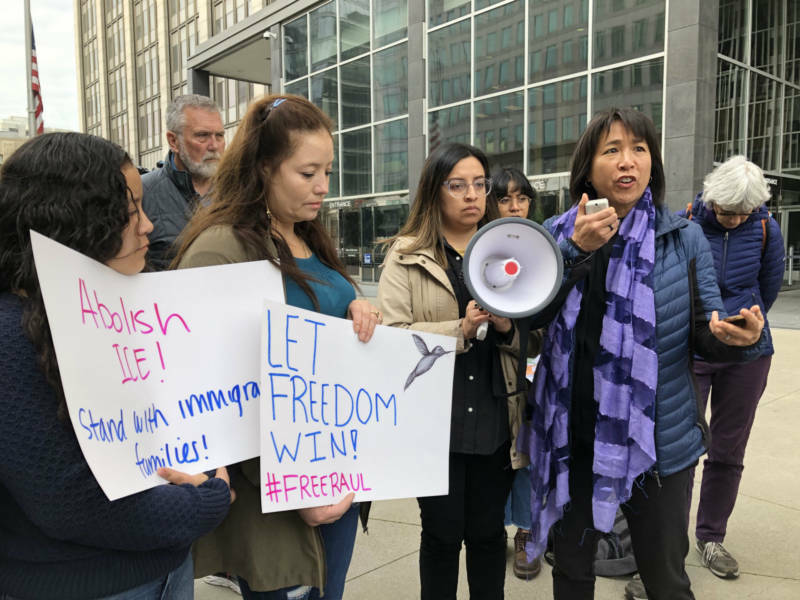 Judge Kim’s order comes amid legal challenges to the indefinite jailing of immigrants, which critics say is a violation of their constitutional rights. Lopez has lived in the United States for nearly 30 years, and while here, petitioned for asylum and checked in regularly with immigration officials. But since 2010, he has been convicted of three misdemeanor DUIs, for which he served a total of six weeks in jail, court documents show. He was also convicted in 2008 of an assault, but that conviction was later reduced from a felony to a misdemeanor. After ICE detained Lopez in 2017, the agency has successfully prevented his release on bond, on the grounds that he is a danger to the community because of his criminal record. An immigration judge agreed and denied Lopez’s release in October 2017. Since then, immigration judges have twice denied him a new bond hearing. In her ruling, Judge Kim said that Lopez’s prolonged detention was no longer justified. The fact that Lopez completed the first phase of an alcohol rehabilitation plan while in immigration detention, and submitted a detailed plan for further treatment if released, showed a “material change” in his circumstances that warrants a new chance for release, she wrote. Lopez’s attorney, Daniel Werner, said his client began abusing alcohol when his mother was diagnosed with cancer and died. But he said Lopez has been rehabilitated. “He made some mistakes, but he basically shouldn’t be detained still,” said Werner, a legal fellow at Dolores Street Community Services in San Francisco. Lopez’s wife, Dianeth, said she and the couple’s two teenage children cried with joy at the news. Most of the estimated 44,000 noncitizens detained by ICE on any given day are released within six months. But 20 percent have spent more than six months locked up, according to researchers at TRAC at Syracuse University. The government argues that prolonged detentions are necessary when immigrants are either a danger to society or pose a flight risk. ICE officers evaluate "the totality of circumstances" to make custody determinations, said Jeffrey Lynch, who directs the ICE field office in Denver, with jurisdiction over the facility where Lopez is detained. Lynch said Lopez also had an additional DUI conviction that was not mentioned in Kim's ruling. "The facts and circumstances around his case, including a conviction for a violent crime and four DUI convictions, deem him a threat to public safety," Lynch said in a statement, adding that the agency would continue to detain Lopez until his case is decided. But Ahilan Arulanantham, a senior counsel at the ACLU of Southern California, said it's unjust for noncitizens like Lopez, who have already served time for previous crimes, to then be imprisoned for months or years by ICE without the chance to argue for their release on bond. In the criminal justice system, by contrast, defendants have the opportunity to appear before a judge within days, he said. “There's really no other place in our legal system anywhere where we permit people to be imprisoned without giving them that very basic right to go in front of a judge and just ask the judge to be released on bond because their imprisonment is not actually necessary,” added Arulanantham. Last year, the U.S. Supreme Court ruled that noncitizens are not entitled to periodic bond hearings, but it sent the case back to a lower court to determine whether indefinite detentions are unconstitutional. Arulanantham, who argued in favor of immigrants before the high court, said the case is now back in U.S. District Court for the Central District of California, where a judge’s injunction still requires detained immigrants to be granted bond hearings every six months.